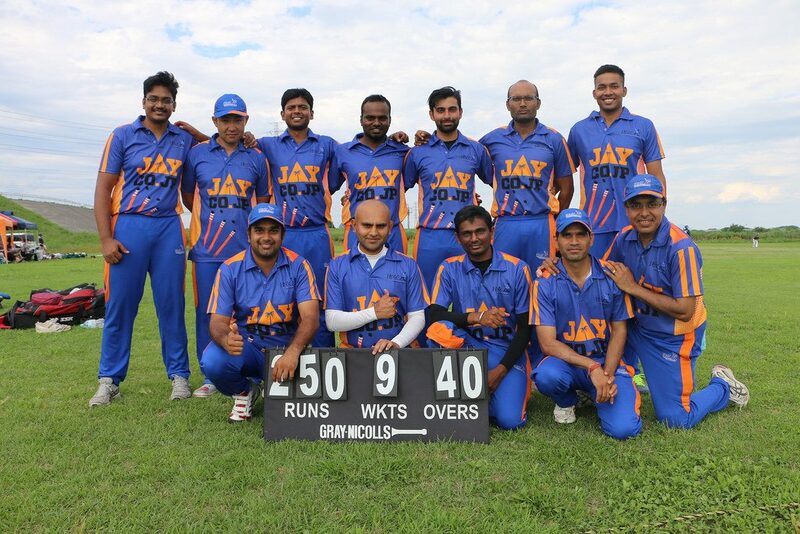 A week after Engineers batting line-up was pulverized by Tigers in a T-20 outing, Engineers turned up with all their might for a longer version of the game(40 over KCL game) and the result was not surprising. Tigers were taken to the cleaners inside 15 overs for half the score of what they had bowled the Engineers out for in the previous week. The T-20 game was clearly a debacle as Engineers couldn’t score even half the runs Tigers had scored, having their top batters failed miserably which put pressure on the middle order who also found it difficult to get going in the face of persistent attack of the Tigers.The embarrassment of being bowled out for 61 runs had stirred the Engineers pride and the aftermath saw the Tigers being blown away for a paltry 31 runs in 13.2 overs. 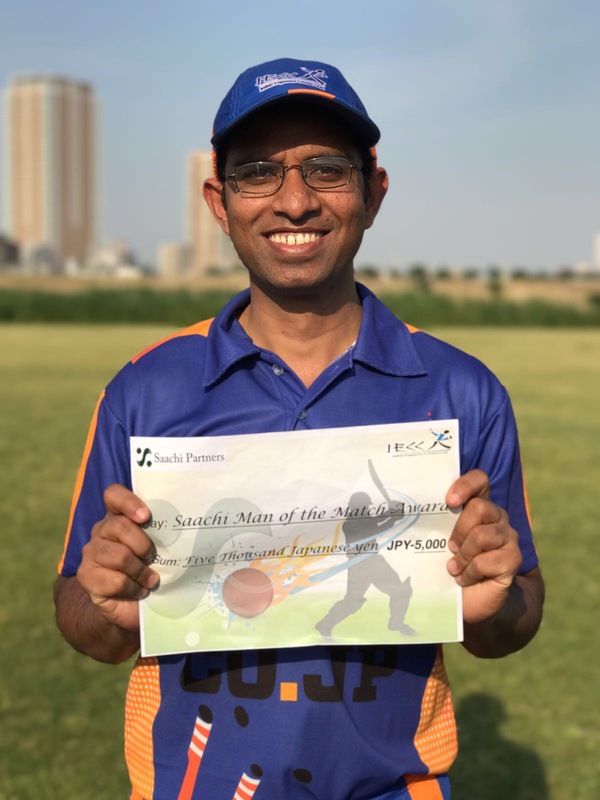 The architects of this revenge victory were Masanao Kobayshi(80), who is a new addition to the Engineers this season, the skipper himself(50) and the tearaway quicks, the two Singhs, Vivek (4 wickets) and Anurag (3 wickets).Having won the toss skipper Vinay didn’t have any hesitation in electing to bat first. With Kobayashi as his opening partner, skipper’s decision to bat first yielded the desired result. The first two overs yielded 18 runs with skipper Vinay appeared to be in the zone. Kobayashi was more circumspect in shot selection but Vinay opened up quite early with a boundary off Tigers’ opening bowler Ankit in the 1st over itself. The unprofessionally dressed Tigers looked disoriented from the beginning itself and the opening batsmen started scoring at will. The Engineers goal was to bat all 40 overs and the openers played their role to lay the foundation. The first 7 overs, after which the first bowling change occurred, saw 40 runs scored with neither of the batsmen showing any discomfort. Change bowler Saneesh started well with only 2 runs coming off his first over and it looked like he could create a break-through. Second change bowler Vishnu Shankar lost the plot in his second over with 17 runs coming off it. That over saw two no-balls one of which went for a four and the resultant free hit was hit for the maximum by Vinay. Tigers skipper Prasanth replaced his expensive bowler after one more his over went for 10 runs. Although Vinay scored at will he did offer a chance in the 12th over by Saneesh but the fielder dropped an easy one. At drinks after 15 overs Engineers were sitting pretty at 93/0 with Vinay 2 short of his half century. Vinay completed his well deserved 50 soon after drinks break . As the bowling looked pretty ordinary skipper decided to accelerate the scoring further and went for shots off Pravin Mohan, who had just started bowling. But the ball didn’t get enough elevation and ended up in the hands of the fielder at deep cover. Tigers celebrated well their first breakthrough. Vinay’s innings contained three 4s and two 6s. Next in was the big name in Kanto Cricket, Prashant Kale. He didn’t waste much time getting used to the pitch and started his business right away. 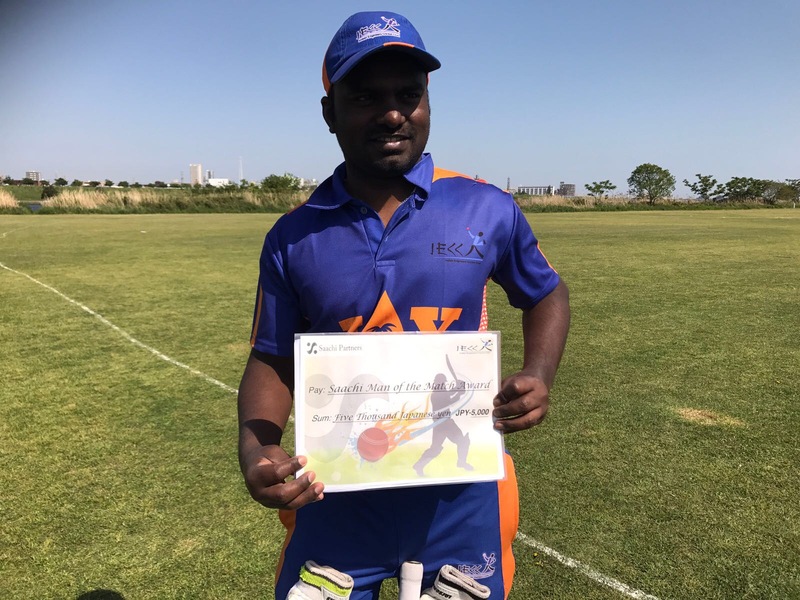 Kale stroked the balls fluently and his effortless innings of 33 came off 36 balls which included five hits to the boundary. Kale’s innings ended when he was caught behind off Ranjit Mouli. A partnership of 53 runs for the 2nd wicket with Kobayashi. Score 150/2 after 27 overs. Next man Pavethy opened his account with a single off the first ball he faced. 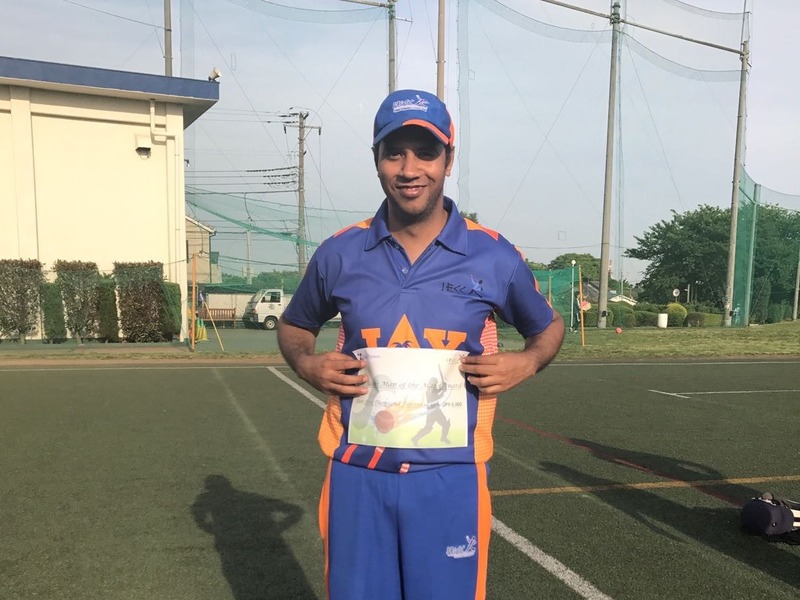 He dispatched the third ball he faced to the fence and in the company of Kobayshi went on to punish the bowlers with ease. Saneesh was brought back for a second spell in between and almost produced a result which would have been a pricey wicket. 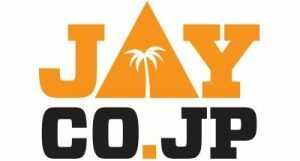 Again the fielder at deep square leg could not hold on to a catch offered by Kobayshi. Two overs later Pavethy perished going after his skipper’s way. In an effort to accelerate the score he succumbed to a fine running catch at deep cover by Ankit Thakur. The partnership produced 33 runs, 23 of which was scored by the outgoing batsman. Paverthy was caught on camera playing some exquisite square drives and classy straight drives by Manu Basava who was the operating the camera. Score 183/3 after 33 overs. After the fall of Pavethy’s wicket and with very few overs left, Kobayshi decided to go after the bowling. Next 23 balls he played had only two dot balls in it and the remaining 21 balls yielded 39 runs during which he completed his well paced 50. Some of Kobayashi’s defense techniques showed why he is considered one of the best in the country. Kobayshi fell at the score of 224 for a personal score of 80 in the 37th over. He was caught behind off Ankit. Very next ball saw Suresh, who was Kobayshi’s partner after the fall of Pavethy’s wicket, clean bowled. Suresh’s 15 came off only 12 balls. With just 4 overs to left in the innings and wickets in hand, incoming batsmen started going for shots which saw the wickets falling in heaps. From 224/4 in the 37th over, Engineers slumped to 250/9 at the end of the 40th over. In between vice captain Anurag Singh was the one who threw spanner in the celebrations of Tigers. With quick wickets, Tigers were having their tail up but Anurag’s innings of 16 runs off only 9 balls dampened their spirit. Especially that six over long on must have been a demoralizing sight for the Tigers. With a target of 251 to chase, Tigers showed intent in the first ball they faced. Rajneesh Shukla was dispatched to straight down the boundary by Ranjit Mouli. He played and missed a few more balls in that over. The batsman showed his intent again in the next over trying to pull a short ball from this writer from the other end but the ball ended up hitting him on the chest due to the pace (or lack thereof!). Your reporter produced the first breakthrough trapping Ranjit Mouli plumb in front of the wicket. Skipper Prasanth walked in next but could not get going with the chase. Both Rajneesh and yours truly bowled decent lines and the latter accounted for the skipper when he played a lofted shot straight down the throat of mid-on. Pavethy didn’t have to move an inch. Score 20/2 after 6 overs. Fielding at mid-on your reporter in between made the incoming batsmen aware of the need to go for shots if they wanted a victory. Some may call it sledging though. The two Singhs, Anurag and new comer Vivek replaced Rajneesh and Biju. With their express pace both bowlers created havoc among the Tigers. At the end of 10 overs Tigers score looked 24/5 with both Anurag and Vivek claiming a wicket each. With the top and middle order wiped out inside 10 overs, Tigers looked clueless against the pace of these two. Three of the next five batsmen were clean bowled which was again beautifully captured by the official photographer of the day, Manu. Last man Saneesh lasted only 3 balls as his middle stump was uprooted by swinging yorker by Anurag. Tigers all out for 31 in 13.5 overs. I Tigers: 31/10 (13.5 ov). Anurag Singh, 3/4 Vivek Singh 4/4.